You can assign discounts or fees to services with the Money, Labor, and Parts price type so that the price of these services can be automatically adjusted depending on assigned discount or fee rate. On the Services page, click Manage Discounts/Fees on the toolbar. Click the Services link next to the appropriate discount or fee. Select a client in the Client box, if you want the service discount or fee to be applied only to this particular customer, click the appropriate service in the Services box, click the right-pointing arrow to move the selected service to the Discount / Fee Services box, if needed, change the discount or fee rate in the Wholesale column and the Retail column, and then click Update. On the Services page, click Select in the Action column next to the appropriate service, and then click Discounts/Fees. 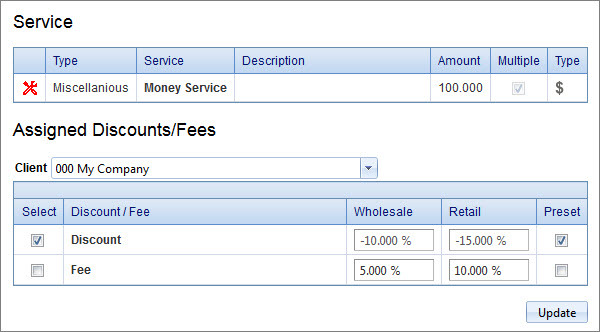 On the Assigned Discounts/Fees page, select a client in the Client box, if you want the service discount or fee to be applied only to this particular customer, select the check box in the Select column next to the appropriate discount or fee, change the rate in the Wholesale and Retail columns, if needed, and select the check box in the Preset column, if you want the discount or fee to be applied by default.